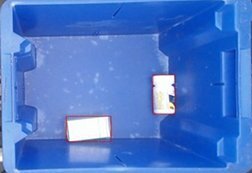 Detects objects or missing objects in containers like tote tubs, automatically preventing incorrect shipments. A simple system that is easily integrated into existing lines combines an industrial camera, lighting, photoeyes, and a PC. 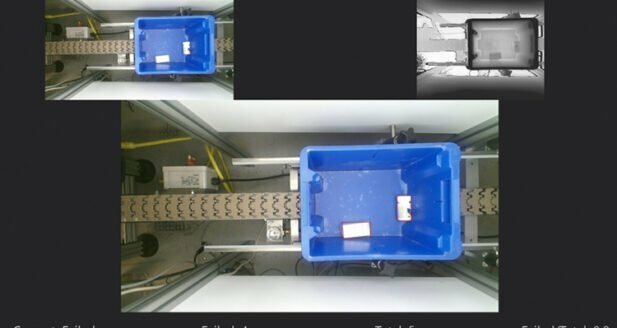 The system images tote tubs moving along a conveyor and provides detection results to the operator of any objects detected. Noncomforming containers can be pulled from the line without any downtime. The system’s image and inspection results are all recorded for future recall and analysis. This robust and innovative system easily detects products by color or depth and can provide inspection results for objects placed in the containers in various locations, tricky orientations, and even varying colors. Customizable features allow the system to accommodate smaller or larger containers, and inspect a larger surface area if required, while still providing the best results. Customer complaints and industry standards are important reasons to verify shipments with the right products, but healthcare companies can face additional hurdles when shipping an incorrect order. Shipping an incorrect order wastes valuable product, and causes the company to have to scramble and pay for expedited shipping to replace the product for the customer who was shorted. For pharmaceutical companies, it can also mean hefty fines for HIPAA violations of $25,000 or more if information from one patient reaches another. As the mail-order pharmacy industry grows and continues to provide convenient services to its patients, there is a more prominent need for automated processes when handling, packaging and distributing medication. Innovative technology such as machine vision systems can help mail-order fulfillment centers guarantee product integrity, safety, and ensure that requirements are met efficiently. Artemis Vision has taken steps to keep up with the evolving industry by developing a technology that confirms the absence of products in totes after filling orders, prior to shipping out to customers. The inspection process not only helps save money but helps to improve quality assurance and reduce customer complaints.